There's magic in the air this Christmas Season in Holiday. Averie Baldwin wants nothing to do with men. 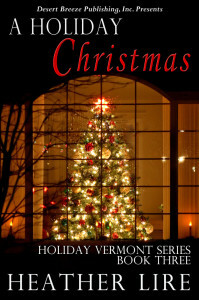 But her family and friends are determined she won't spend her first Christmas back in Holiday, Vermont alone. So far she’s managed to avoid all their attempts to set her up on dates. Until she’s chosen to represent the school district in the town's annual Christmas play...with the sexiest man she's ever seen. I’m going to keep this review short and sweet just like the story. I love Heather’s stories and am ready for her to give me more (Hint Hint). Averie is a bit gun shy when it comes to men. She isn’t really looking for a relationship but finds herself drawn to a local lawman who makes her wonder if maybe she should give having a man another chance. She’s a sweet person who has a hard time letting her walls down but with him something just feels right. She’s so willing to give of herself but it was nice to see someone want to give her the world and really get her. Corie hasn’t had a perfect life no matter what the outside world thinks. He’s a man who was abandoned by his family and lucky enough to land in the arms of a family who made him feel like maybe he wasn’t disposable after all. He’s extremely loyal to them and when things happen that shake him to his core it causes him to have to rethink what he knew and what he knows now so he can have a future with the woman who has intrigued him from the moment he first saw her. When we start this story we get to see two people who aren’t quite sure exactly who they are as individuals but as they spend more and more time around each other they sense what they can be together. I liked how willing he was to take things at her pace no matter what his body was telling him. He’s such a sweet man and seeing him fall for her was fun. I also loved how both of them became such a team in a very short time. There are some moments that are a bit tough but you get to see what they are both made of in those moments and they end up meaning the world to both of them. I can’t say enough to tell you to pick up this series for sweet romances with characters you really get behind. I love that Heather has been wonderful enough to share these with me in hopes that I would love them like she loved writing them. I have to say this but even though Heather was nice enough to provide this to me for review this has no bearing on my ratings.